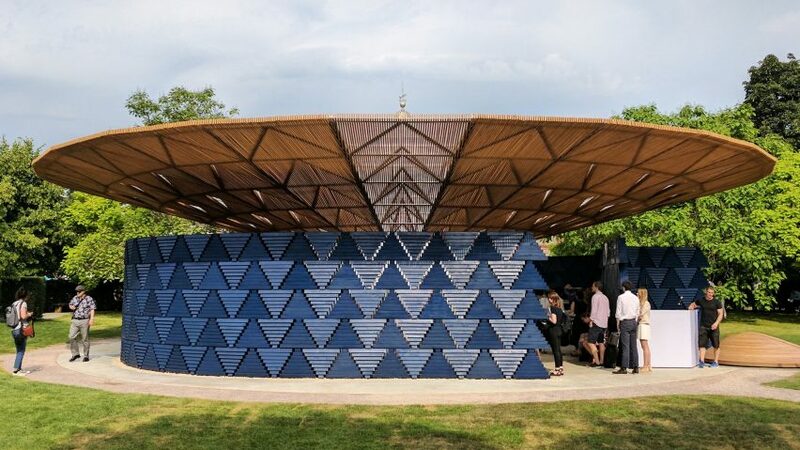 Burkinabe architect Diébédo Francis Kéré has unveiled this year's Serpentine Pavilion, an indigo-blue structure with a latticed canopy and a courtyard at its centre that will be transformed into a waterfall when it rains. Kéré is the 17th architect to take on the annual commission for the pavilion, which is erected each summer outside the Serpentine Gallery in London's Kensington Gardens. The architect, who is based between his hometown of Gando in Burkina Faso and an office in Berlin, references the idea of a tree as a gathering space for his pavilion design. "The concept was simple, I was inspired the form of a tree in the landscape," said Kéré, speaking at a press preview of the pavilion this morning. The structure is enclosed by curving sections of indigo-coloured wall and a tilted ring-shaped canopy. The rich blue colouring is of particular significance for Kéré. "In my culture blue is an important colour. For a young man when you're going to meet the dream of your life for the first time, you wear the best clothes you have," Kéré explained. "And in past times there was only one piece of blue boubou – the traditional clothes that people wear. You dress blue, and you're shining as you approach the house of your dream. And everyone knows, with this guy, I cannot compete, I'm done, because this guy is so shining," he added. "What I wanted to do here, I wanted to present myself, my architecture, in blue – it is a great place, and if you have the chance to do something like I did here you come with your best colour, you show yourself from your best side. This is indigo blue." The walls are made up of triangular sections of wood, which create a design of V-shaped perforations. The slatted-timber roof features the same triangular motif, with some of the panels angling upwards to allow light into the pavilion. An oval well at the centre of the roof is supported by a latticed steel framework and surrounded by polycarbonate sheeting. This is designed to funnel rain water down into a waterfall that will replace a gravelled courtyard in inclement weather. The 9,000 litres of water collected will be used to irrigate the park. "If you look up it changes wherever you turn, there are openings, because that's what we wanted to do," said Kéré. "Maybe naively, we wanted you to still be connected to nature. As you enter this pavilion you will see the trees, you go inside this void and you will have the connection to the sky." "I hope it will rain soon, and you will feel safe, protected by the structure. You will see the effect of a waterfall here in the middle of the pavilion." Kéré grew up in Gando before moving to Germany to work as an apprentice. He later studied architecture and engineering at the Technische Universität in Berlin. His first major project as a still-qualifying architect was to build a primary school for his home village, for which he raised the money himself. He returned to study and graduated in 2004. Since then Kéré has built his reputation on his socially driven and sustainable approach to architecture. He was selected to design this year's pavilion by Serpentine Gallery director Hans Obrist and Yana Peel, with the help of architects Richard Rogers and David Adjaye. He unveiled initial plans for the pavilion in February. This is the first time the architect for the pavilion was not selected by former gallery director Julia Peyton-Jones, who founded the programme, but left the role last year. Since 2000, the Serpentine Galleries has commissioned a different architect to create its pavilion each year, offering them the chance to create their first built structure in England. Previous pavilions have been designed by Peter Zumthor, Frank Gehry, Herzog & de Meuron and Sou Fujimoto. Last year Bjarke Ingels designed an "unzipped wall" for his commission. Kéré's Serpentine Pavilion will be open to the public from 23 June to 8 October 2017. Main image is by Ben Hobson and copyright Dezeen.